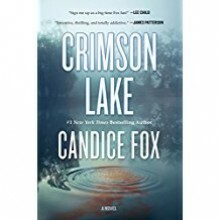 Crimson Lake, by Sydney-based, Ned Kelly Award-winning author Candice Fox, is a thrilling contemporary crime novel set in Queensland, Australia, perfect for readers of authors like James Patterson, Harlan Coben, Lisa Gardner, and Tana French. There, Ted’s lawyer introduces him to eccentric private investigator Amanda Pharrell, herself a convicted murderer. Not entirely convinced Amanda is a cold-blooded killer, Ted agrees to help with her investigation, a case full of deception and obsession, while secretly digging into her troubled past. The residents of Crimson Lake are watching the pair's every move... and the town offers no place to hide. TW: This book is about a guy accused of a crime on a minor. I really enjoyed this book, I enjoyed it more than I thought I would. It is basically three mysteries in one book. Three different crimes and three different suspects. You would think it gets confusing but it really doesn’t. The writing is great and even though the three different stories in one, it is super easy to follow. It takes place in Australia, I never been there yet I had a great picture if it form the book, I really enjoyed the world building. It was well described but not overly, just the right amount. The book, keeps you guessing, it gets you close and then jus leaves you with more question until the end. Something friendship and relationship wise I saw coming but the main plot and “who done it”, I did not see coming as much if at all. I thought about it a couple times but then was like “nahhhh” but that is just part of how the story plays with you. One of my favorite parts of the book were the “Dear Jake” letters, creepy and fun to read. Characters, I liked them and I liked the mix of a bit of everything. From nice to bad and the weird and everything in between. I liked Ted…. I think …..for the most part I liked him but there were a few definite moments and actions I was really weirded-out by him and not sure what to think of him , But I think that was meant to be by the author. I really liked Amanda, even with all her quirks … maybe even more so. She also brought a bit of humor into the story. Fabina….. I’m honestly not sure about her … maybe we see more if her next book. I liked how everything came together at the end, and how other things left a bit open for the next book. I for one, am really looking forward to read book two. New Release Review! 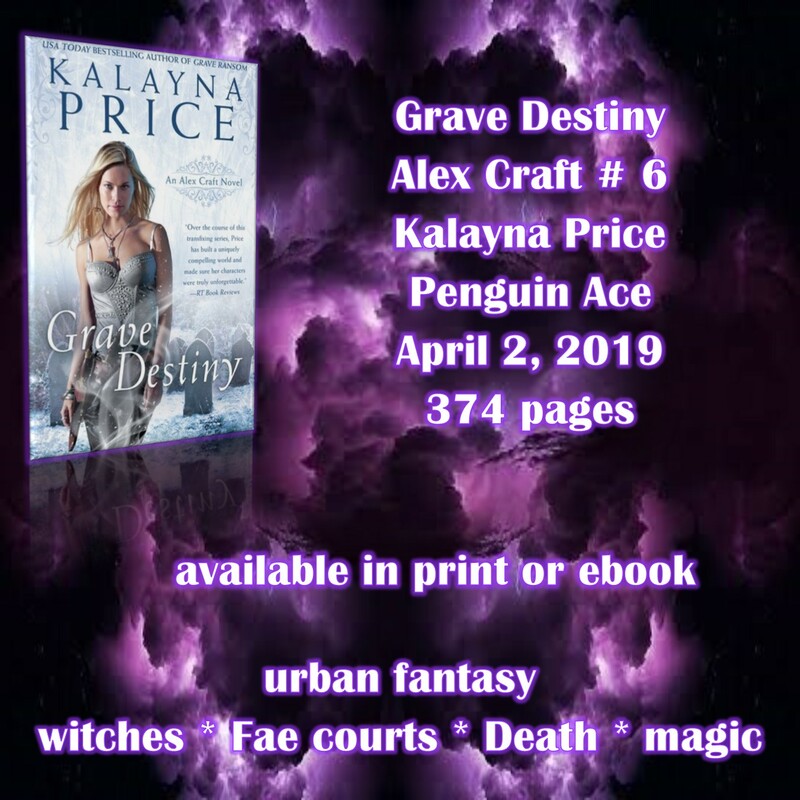 Grave Destiny (Alex Craft #6) Kalayna Price! Good Morning, Readers! 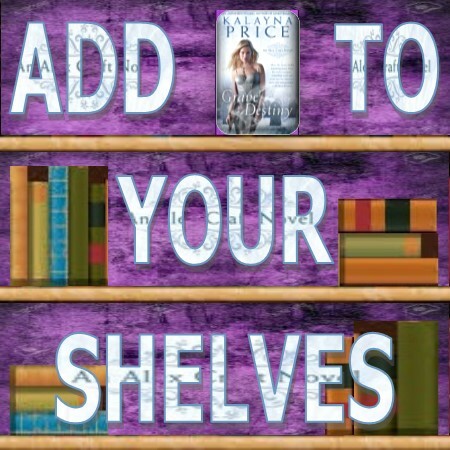 Today, I am sharing the newest release from Kalayna Price! Enjoy and don't forget to add Grave Destiny to your shelves! While trying to come to terms with her changing powers and her growing ties to Faerie, Alex is asked to investigate a politically sensitive murder by a fae prince. With FIB agent Falin Andrews along as her backup, Alex soon discovers that the intricate of web of alliances and intrigue in the Faerie courts is strained to the limits and war is about to break out. 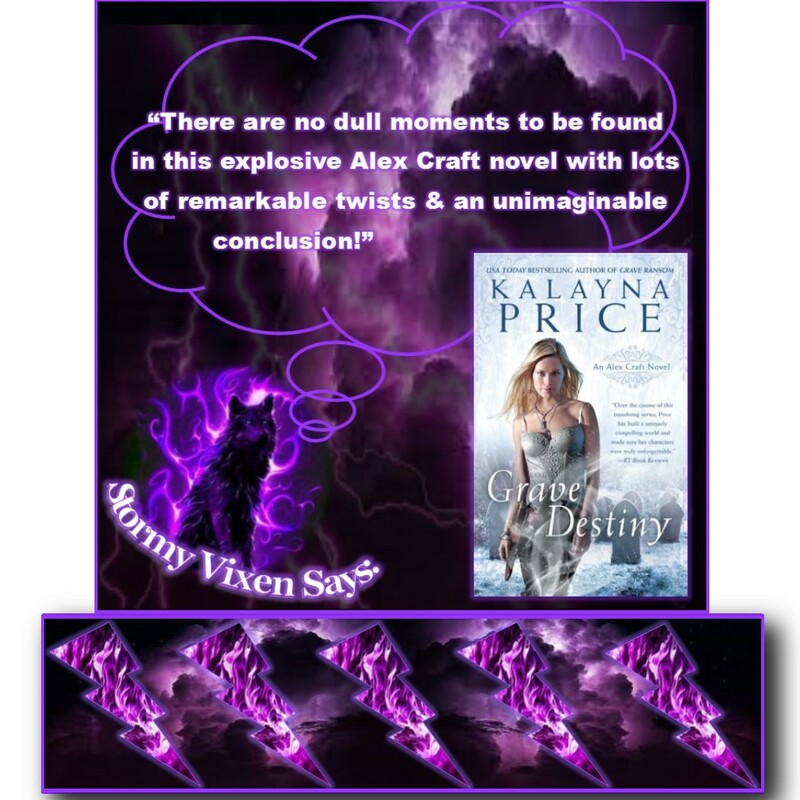 Adrenaline pumping thrills and chills abound throughout this explosive Alex Craft novel. Falin and Alex’s chemistry sizzles with lots of sparks as she reluctantly allows him to back her up but their relationship is still full of emotional turmoil and obstacles that has Falin holding back. The story also has hints of chemistry between Alex and other previous relationships which adds to the spice and turmoil of the story, while also adding depth to the characters. 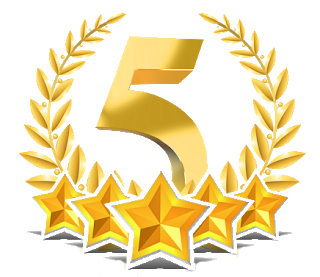 Readers have to keep turning the pages as the fast pace of the intriguing and adrenaline pumping events ensure that there is never a dull moment to be found throughout, while remarkable twists surprise readers along the way ensuring that they can’t possibly guess what might happen next. The conclusion is one that readers can’t possible imagine beforehand and the suspense of the story covers both Alex’s personal life including her growing abilities and the happenings in the courts which makes this story so entertaining that readers don’t want to blink in case they miss something. New Release Review! 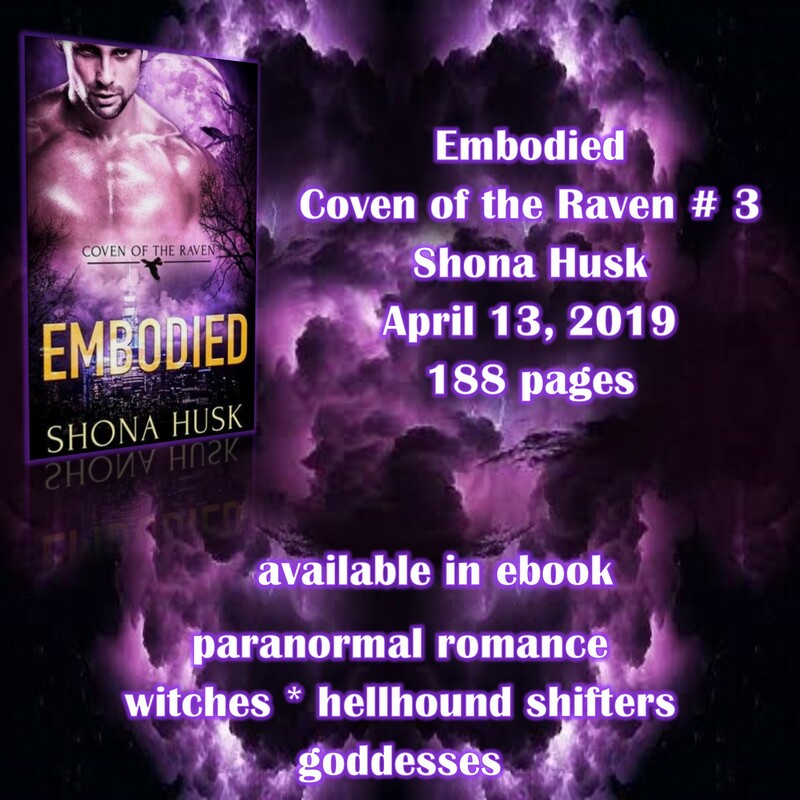 Embodied (Coven of the Raven #3) Shona Husk! Welcome back, readers! Today, I am visiting with the Coven of the Raven to discuss thier recent dealings with a goddess! 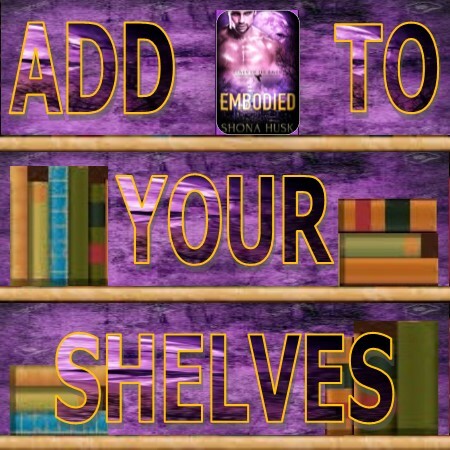 Enjoy and don't forget to add Embodied by Shona Husk to your shelves! Alexis’s body has been hijacked by a goddess and while she is willing to do anything to catch the eye of her boss, he finally takes notice for all the wrong reasons. Despite his interest, Peyton is determined to keep the relationship professional until Alexis shows up for work crackling from magic and wanting more from him than he’s able to give. 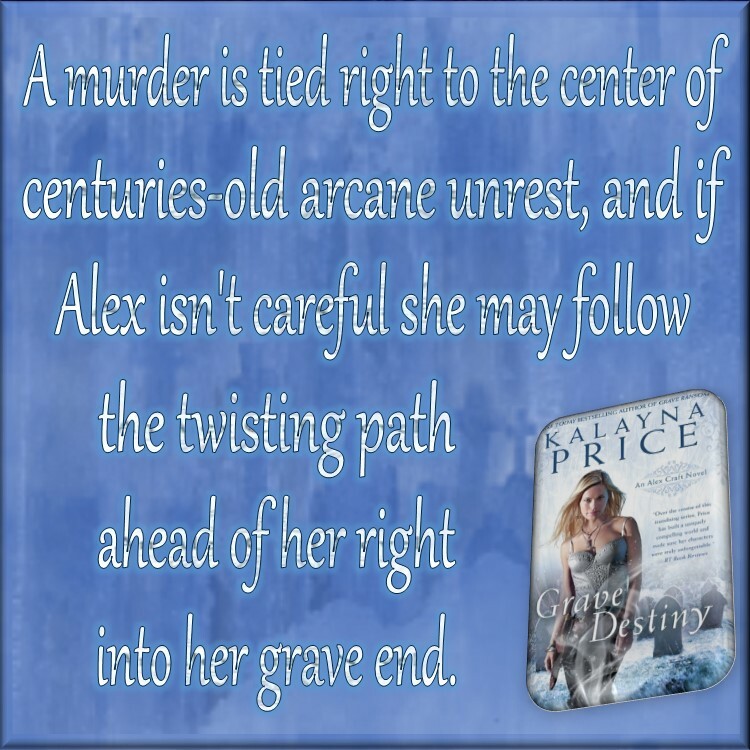 This fascinating and entertaining story explodes from the pages with lots of sizzling chemistry and scorching heat between Alexis and Peyton, which could be a bad thing is this case as a goddess could cost Alexis and Peyton their lives. 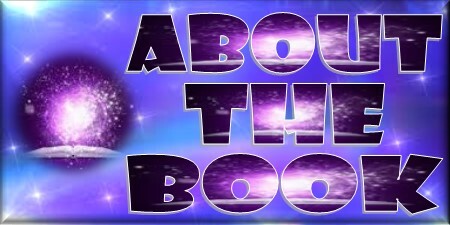 Which makes this relationship a bit of complicated mess with lots of emotional turmoil that readers can’t help but become caught up in as Peyton tries to convince Alexis what will happen to her if she continues on the path that she is on. Although, the characters are a perfect match for each other, readers may find that they are both a little too emotionally needy and ready to take the easiest solution to their problems and issues. 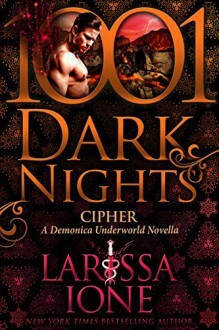 The story is fast paced and full of intriguing and unique elements that involve witches, hellhound shifters, goddesses, possession, ravens and a whole gang of cats. The story is full of scorching passion, hot scenes of intimacy and thrilling suspense that keeps readers glued to the pages of this entertaining read. 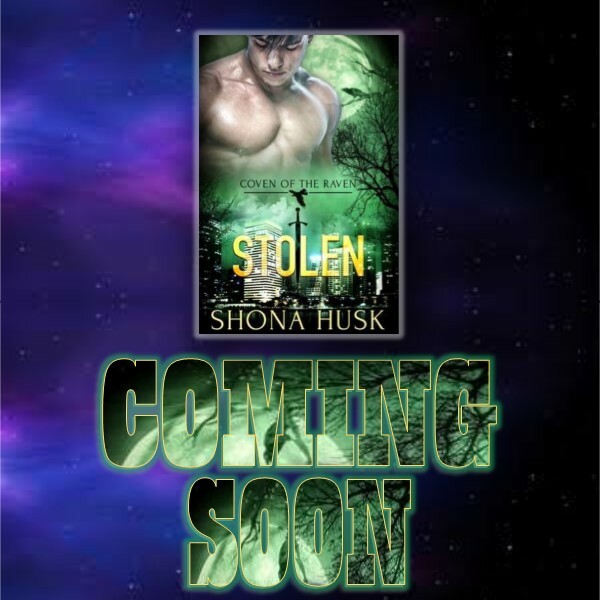 Romance author Shona Husk lives in Western Australia at the edge of the Indian Ocean. 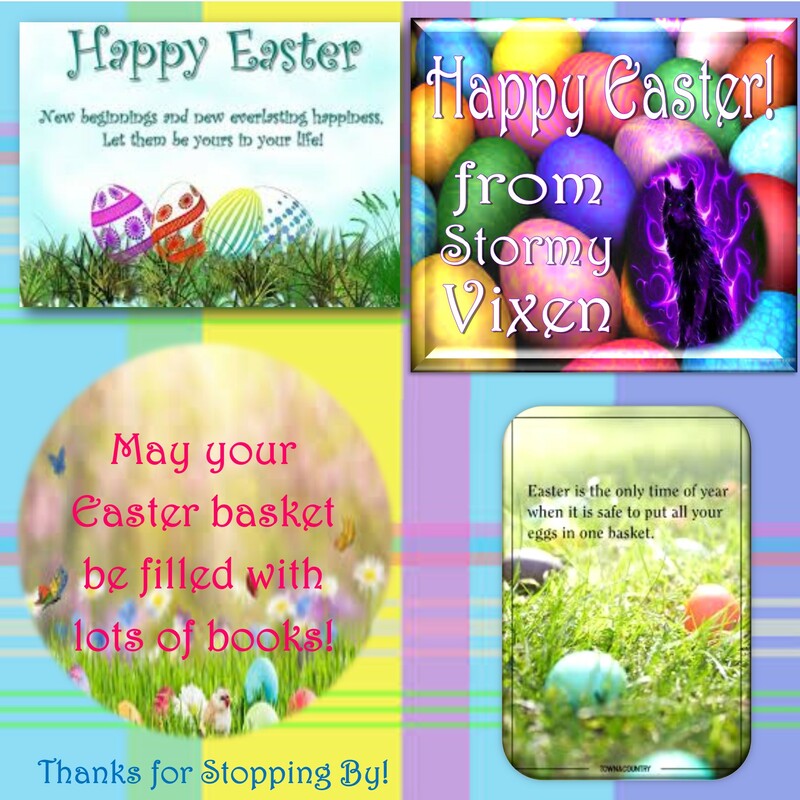 Blessed with a lively imagination she spent most of her childhood making up stories. As an adult she discovered romance novels and hasn’t looked back. 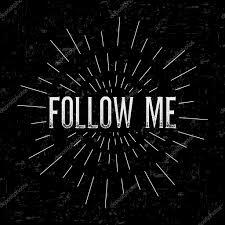 Sign up to receive my newsletter and some free stories. Second in the Duke's Den series that follows three friends who invest together, Anything But a Duke follows the one without a title, Aidan Iverson. He's been able to rise from a childhood where the mother he can't remember left him and his sister and amassed great wealth. What he can't seem to overcome is the snobbery of the ton and certain doors remain closed to him. He decides that marrying an aristocrats daughter is his gateway to all these doors. Diana doesn't want to get married and is trying to keep her family afloat by creating an invention that members of the Duke's Den will want to invest in. Her and her mother come to an agreement that if by the end of the month, if her invention doesn't become profitable, she will have to marry. When a chance encounter has her rescuing and kissing a mystery man, who turns out to be one of the investors she's supposed to impress, her world gets shaken. Diana Ashby drew him. She always had. Her confidence. Her fearlessness. From the moment they’d met. Aidan's plan to marry an aristocratic, while mercenary, did work as a ploy to achieve what he wanted. For having two friends of that world, a duke and and a marquess, I thought the story thread oddly underutilized them. It is set-up so that Diana, who is not nobility but has friends of that world, gets into a deal with him to try and set him up, while his side of the bargain is to get more investors for her. It worked but was also all a little coerced. There's a second thread underlying the romance one with Aidan searching for information about his birth mother and the sister he hopes escaped an orphanage fire. I thought this was rife for some great emotion but it was pushed to the side too much for me. Even when Aidan gets the answers he was searching for, the reveal fell a bit flat as character relationships in this thread weren't explored and Diana wasn't a huge part of this thread for Aidan to share with her. I did believe in why he fell in love with Diana but again, the emotional moments where he is choosing her over his ambition, fell a bit flat. Every moment that they shared, every detail they revealed, made her want more. I also would have liked a bit more of Diana's family relationships explored, especially with her mother or maybe a flashback or two with her father. Her father seemed to be like an absent minded professor, except with inventing. Part of her wanting to succeed was to show her father's pursuits weren't all a waste of time. We get a pretty good feel for her relationship with her twin brother, a seemingly wastrel but sticks up for Diana but her relationship with her mother was fairly blank. We know, because of their money issues, her mother is pressuring her to get married but the mother doesn't really appear on the pages and I missed feeling that aspect of Diana's life. While I believed in why Aidan feel in love with Diana, I didn't believe in it as strongly from Diana's side. He treats her well, the biggest being he embraces her inventor side, and she finds him attractive but I just didn't get see or get a handle on Diana developing feelings for him. As I mentioned, Diana and Aidan's deal, he introduces her to investors to push her vacuum prototype and she introduces him to ladies of the nobility to find a wife and if she doesn't succeed in finding him a wife she must marry him at the end of the month, was a pretty coerced story plot. At the end, there is some angst where I didn't understand at all Diana's reluctance or refusals, that made it feel even more forced. Everyone is likeable and the story is nice but not a lot new here and all pretty sedate. If looking for a quieter, tried and true formula romance, this would be a nice pick. I'll be looking forward to the third in the series coming up where Aidan's roguish marquess friend will be finding love.